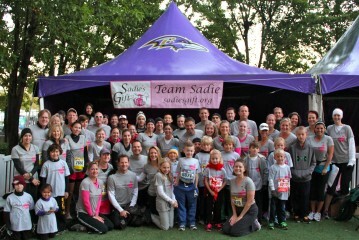 Congratulations Team Sadie 2012 This entry was posted in Blog and tagged baltimore running festival, johns hopkins children's center, race day, Sadie, sadie's gift, team sadie. What a BEAUTIFUL day to run in Baltimore yesterday. Team Sadie shined! We can’t possibly pull off such a great event as yesterday without the help of many, many friends of Sadie’s Gift. The first one has to go to our Hospitality Tent Masters the Wolf’s and the Rives!! I hope you had a chance to thank them yesterday because they make it all happen on race day. It is no small feat to make it work for over 185 nervous runners and their families. We love you guys and love that you are crazy enough to do this for us year after year! We thank our buddy Frank at Frank’s Wine in Delware for providing all our post-race beer and the popular champagne-in-a-can! A special thank you goes to Derek at T-Bonz Grille & Pub for our incredible post-race buffet. Derek moved quickly within a short time frame to make our race day food happen this year. We were thrilled with the incredible variety and his generosity. We plan to support him with a thank you event soon. Our continued coverage by WJZ-TV is coordinated by our good friend Eric Kettering. Links will be posted to our Sadie’s Gift website soon! Thank you, Eric. Thanks to Einstein Bagels for discounted coffee & bagels and to our friends at Maryland Brand Management for discounted printing on our awesome shirts. Our dear friends John & Michelle Simon provided incredible massages to soothe all our throbbing legs, aches and pains. Thank you for your continued love and support for Sadie! We have an incredible relationship with Corrigan Sports, the BRF race director. We cannot thank them enough for their support and promotion of charities at the Baltimore Running Festival. They provided our incredible tent, extended their corporate discount with Under Armor for our Team Sadie shirts, and helped us with runner registrations and snafu’s along the way. Many of you commented on our great Team Sadie 2012 shirt design! We love it, too and have Jill Snavely, our resident graphic designer to thank! We also need to thank Uncle Scott & Aunt Donna for picking up “the booze” in Delware and to Jen Jackson for delivering the food. Aunt Neddy was our team photographer this year! She did an incredible job and we really appreciated her hard work and amazing images. Donations have been pouring in over the last several days. It’s too early to give out any final numbers because there is still time before our team deadline this Saturday, October 20th! This is a great time to send out a picture of yourself from yesterday (or our team shot) to your friends and family to let them know you made it! Thank those who have supported you and remind others that it is not too late. All minimum donations commitments of $250 are due by this Saturday, October 20th. Please let us know if you have any questions on where you stand or check your web page HERE. All checks should be made to: Johns Hopkins Children’s Center/Sadie’s Gift. They can be mailed to us at: 2510 Johnathan Road, Ellicott City, MD 21042. Please post your pictures on the Team Sadie Facebook page!! See our (Aunt Neddy’s) pictures in the Team Sadie 2012 album! There are always things that don’t go perfectly (9 am Team Picture? Bueler?) and areas we need to improve (“I just ran a marathon and you couldn’t save me a dang chicken wing?! ?”), but overall it was all of you who made Team Sadie 2012 a success. You are still having incredible success in your fund raising. You may have achieved your running goal or even surpassed it this year. You built new relationships, came together as a team to serve others and spread Sadie’s gifts all over Baltimore yesterday. We continue to honor God as the CEO and Founder of Sadie’s Gift and thank Him profusely for giving us all of YOU! Thank you for being a part of Team Sadie 2012.